Zuma’s younger sibling in Fitzrovia gets top marks for glitz and glamour, for the theatre of watching chefs at the robata grill, and for impeccable cooking. Zuma’s younger sibling gets top marks for glitz and glamour. Much of the action takes place on full show at the central robata grill, where a repertoire (similar to Zuma’s) of contemporary izakaya-inspired food is created. The knotted wooden counter, framed by glass cases displaying the day’s produce, is filled with expectant punters enjoying the show. The tasting menu is popular with first-time diners, taking them on a spin of the best that Roka has to offer. Ours started with a spicy spiral of own-made kimchi. Next came a sashimi platter elegantly presented over crushed ice, and including flavoursome minced tuna with spring onions to be scooped on to crisp, black bread. Sticky skewers of tebasaki (chicken wings) were succulent, while charred salmon served with pickled onion and a tare sauce was crisp-skinned and soft-centred. Another highlight was a showy trio of desserts, which featured Pocky-style chocolate and sesame biscuit sticks. The tasting menu isn’t cheap, but each dish was impeccable. At such prices, though, service has to be spot on, and ours faltered towards the end. It took an age to get the bill, and we were made to wait further by the chilly door as attempts to retrieve our coats and bags were ignored. This place is a jewel! the decoration is beautiful, with a natural wooden bar. The food is amazing, roasted meats and truffle sashimis are a blessing. Although not being especially cheap, it's definitely a place to recommend for a tasteful, high-quality, Asia-inspired meal. The staff is a bit lazy but the sommeliers very good and helpful. This place always has me coming back for more! With it's dimly lit Shochu lounge and decadent cocktails which are a treat. From the lipstick rose to the long list of Sake, Japanese whiskey, yes you heard that right to the large block of ice that is central to the experience. The mixologist are creative and dynamic and if you ask nicely they will make you something special. I had a custom made Negroni but with aperol and nikka Yoichi whiskey. Whilst not cheap it certainly hit the spot. They also have a great selection of sushi and sashimi or you can order from Rokas main menu. Word of caution be careful you don't overindulge as this is a basement bar and the stairs are very narrow . My boyfriend organised the dinner as a part of my birthday gift and I was nothing short of psyched. Immediately after stepping into the restaurant on Charlotte St I felt comfortable and at home, which is usually not the case going into nicer restaurants. Our server was down to earth, full of enthusiasm and very helpful (wish I remembered her name!). We ordered premium tasting menu accompanied by really nice quality of sake. Everything was exceptional! Yellowtail carpaccio with truffles, sashimi that melts in your mouth, wagyu beef with the side of the most delicious mushrooms,… to end this journey on a high (and sweet note) we were served a platter of desserts, including fresh fruit and brownie with matcha. Seriously one of my favourite dining experiences so far! Roka.... Now I see what all the hype is about.... We came here for some cocktails and giggles...we got that alright! Its such a busy spot you'll be lucky if you even get a spot at the bar...but persevere as its so so worth it. The cocktails here are some of the best I've had in London..
With layers,depth and beauty...its a winner we all want! They're also not as expensive as other Mayfair bars I've been to. With cocktails beginning at £11 and ending at £13 I think its a bargain for the quality you're getting. A beautiful space where you can enjoy just a beautiful food and drinks. My husband and I enjoyed a decadent dinner and cocktails evening at Roka on Charlotte Street. The food was fresh and well presented and up-most of all tasted amazing- full of flavour and unique ingredients. The cocktails were quite powerful and again used an array of unique ingredients creating Asian inspired drinks. It was quite busy during the time we went and understood the staff were run off their feet however as the time went on the service was still lacking slightly. We felt our cocktail and food wait was a tad too long and even asking for water did take it's time. When it came to the end of the night and tables began to clear away, it still took nearly 20 minutes to be able to ask for the bill and another 10 odd minutes for the bill to arrive- however it was the wrong bill/ I believe that evening the staff were a tad flustered and the customers could tell that this evening had not gone as smoothly as hoped. I still recommend dining at Roka however best try go when you don't mind heading home late. This is without a doubt, my favourite place to have sushi in London! We had booked a table in the bar but because it was so loud, we asked if we could move to the restaurant. They accommodated us although we had to wait for seats to become free at the bar. The sushi was so fresh and the grilled meats were succulent. Every dish we had was scrumptious! They also have a wide selection of cocktails and drinks to choose from. My favourite part of the meal was the mixed dessert platter which they didn't charge us for as we had to wait a little bit for the seats to come free. It was a gesture that was appreciated as the desserts were delicious. I first came to Roka 10 years ago and abosulety loved it. I can't say much has changed in 10 years, it is still a beautifully hip, painfully expensive restaurant but the food and the service are worth it. Although we've been to Roka before, we opted for the (cheaper) tasting menu, which didn't disappoint with a good assortment of flavouts. As we happened to mention that it was our anniversary, our desert arrived with a personalised board, which was a nice touch although the 'desert' was mainly fresh fruit which I found underwhelming considering the menu was £43 per person. 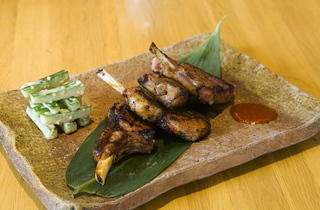 It's also worth mentioning that as Roka is so popular, they can be quite strict on their 2 hour table bookings. The table next to us were essentially ejected from their table which wasn't well received (as you would expect) and resulted in the service charge being removed from the bill. There were no service complaints from us though, although that may or may not have been related to the complementary after drinks we received. This is a really nice, high end chain for a special occasion; come prepared to spend money freely and leave within 2 hours. There are not enough stars or superlatives for the experience we had on Friday. As a special treat to celebrate a friends leaving for a role abroad - we booked a Time out blow out -and had the 7 course Kaiseke menu with cocktail pairings. Firstly it is a really personal experience. We were greeted by name and all the staff were really friendly and made us feel very special. On this particular night there were only the three of us, I guess on others there might be up to about 8 - but part of the deal is you basically have your own personal waiter who explains each dish and cocktail and makes the cocktail. Our host Giorgio was amazing. It is all so perfectly balanced to titilate your taste buds, all the food was delicious and some of it like wagyu tempura roll were truly extraordinary. The cocktails are really unusual and do really enhance the tastes of the food. There were a couple that were a bit strong for me and one I really didn't like but that in a funny way only really enhances the experience, as it showed it was a gastronomic challenge not just an easy ride. The dessert platter was visually dramatic and impressive and despite being pretty full we polished off every last bit. There were some amazing doughnuts, a parfait that had a beautiful cake like texture, a peanut butter sundae and all sorts of sorbet and fruit! The menu is served in the basement Shochu lounge which has a really buzzy yet relaxed and stylish vibe. Roka pay attention to the details - from home made block of ice that are hand carved for each drink, to beautiful floral decorations on the table. Lots of the cocktails are massively theatrical in their preparation. The menu comes in at £108 per person with service which is, I recognise a lot of money, but i genuinely feel we got more than our money's worth. I would love to go again and will certainly return to Roka to sample some of the regular menu and cocktails. I'd say its a really hard choice whetehr this or Sushi Samba are the best overall experience. One of the nicest meals i've had - truly good stuff! We went for a birthday last year and did the tasting menu which was perfect for us as it all looked so good. Everyone raves about the black cod and quite rightly so, it was certainly the most memorable in an excellent selection of dishes! The desert platter is something to behold as well - i'll definitely be going back! superb dishes and dessert to die for. Amazing - fanatatic food, service and ambiance - you can't beat it! Probably my favourite Japanese in London. Great food and great atmosphere. Key dishes- soft shell crab maki, egg plant salad, seared beef and truffle, Seabeam, black cod. The desert to try is yoghurt and almond. It doesn't sound great but it's divine. All paired with a lovely bottle of Albarinio. A perfect evening with a dear friend over from Singapore. I went here with a friend and the food is AMAZING. My friend was 10 minutes late, however, and the waiters made me feel pretty uncomfortable at the start - I didn't want to order anything until she arrived. But after that things cheered up. The only down-side with great food is that it's often really expensive - definitely the case with this place. They also took my rice away before I'd finished, which was a bit annoying. Overall, great food, not such a great price and the service was good, but a little awkward at times! My favourite Japanese restaurant in London town (Charlotte Street) for a delicious dining experience. The food is fresh, delicious, original and fusion style. Keep some room for the deserts (they are all good!). While I found the top floor a little noisy, the Shochu Lounge offers an intimate atmosphere for lunch or dining. Try the Twinkle cocktail. You can never go wrong with Roka! Absolutely brilliant! It doesn't just taste amazing, the aesthetical issue leads to a satisfaction of the senses. You haven't had sushi (particularly the eel and wagyue), unless you've tried this one. But also the other dishes, like the cod, is made in the best possible way, the perfect amount, so you can have a good conversation while eating. The service is quick and very polite, reservations work perfectly. Not to stiff and certainly worth it's price. Favourite restaurant in London, and not only because nowhere else you don't want to eat your dish due to it's optical perfection, but also cause it's by far the best Asian food I had so far. Recommend it to everyone, particularly for a nice lunch. Hint: Have a tasting menu, you'll have everything in there and won't ever be dissapointed. Disappointed by the whole dining experience and wouldn't recommend this place to anyone, even though the food was delicious and flavoursome. We went downstairs for pre dinner drinks at Shochu bar, as we arrived an hour early. We were sat at a table and said we had an 8pm booking. We weren't offered to order any snacks prior to our meal - which I found odd. We had to enquire twice if our table was ready and at 8:15pm finally taken up to our table - makes me wonder would we have been standing waiting for 15 minutes upstairs? When we sat at the table we decided to order the premium tasting menu. The first 4 or 5 dishes were beautifully presented on a dish filled with ice as they were served cold. When we had finished all of the items, the did the grilled Scallop came next timed perfectly. After we ate the scallops, then the disappointment came - we felt like it was a rushed job to get us out the door with hot food getting cold on the table, we had to ask them to hold off on brining more food immediately only to be told that was the last of the main dishes. 4 hot dishes on our table was way too much food from a tasting menu. The food became cool and felt like we were being rushed through our meal. Ended up having to say do not bring the desserts until we ask - this is really poor form from a restaurant that offers a tasting menu. I had high hopes for Roka but the restaurant's attitude was not up to scratch and the experience of dining there was disappointing. The staff in the dining area provided great service and were attentative - shame the attitude of the restaurant for a tasting menu isn't one dish at a time - which it is at many restaurants that offer a tasting menu. What a huge disappointment in terms of customer service! I asked if they had half bottles of wine and the sommelier said that they didn't but could open a bottle and offer a craft. Seemed like an excellent and convenient service to offer customers who want more than 1 glass but can't quite finish a full bottle. So the wine I ordered was priced at GBP64 for the full bottle. I figured the craft wasn't going to be quite half but should be 40-45 (otherwise why not get the full bottle). The bill comes and shockingly they charged me GBP54 for a craft!!!! What a rip-off!!! I was better off ordering the full bottle of wine with pricing like that. I complained to the waiter how disappointed and shockingly surprised I was with what they charged me for a craft of wine. He apologized and asked if I wanted to speak to a manager. Along comes the manager, Aurelien. He starts off the conversation defensively asking if I had a "problem" with the wine. I explained that I was disappointed with their pricing policy. He started explaining the difference in size (as if I didn’t know that a bottle was 750ml). I explained that my point was that the sommelier should have informed me that I was better off just having the full bottle. He said that he will tell his staff to do this going forward. He then charged my credit card and said thank you very much…as if that was going to make me feel better! Is this the type of customer service you’d expect from a restaurant of this caliber with a bill that was over GBP200. This was so disappointing and I could never recommend Roka again. I’ve been to both locations several times and will never return! Absolutely amazing food. I highly recommend the ribs and the tempura tiger prawns. Service was excellent - friendly but attentive and (unlike many resturants of this type) not at all condescending. Can't wait to go back. This is one of my favourite places in London. For me it ticks all the boxes, great design, great atmosphere and of course top notch food and service. Foodwise, ignore the yakitori stuff (I know the robota grill its what they are known for) go for the fish. The tuna sashimi and green apple is to die for as well as the deep fried rock shrimp.